You can create a mailing list in the Account Control Center, making it easier and more efficient to send out newsletters and updates. 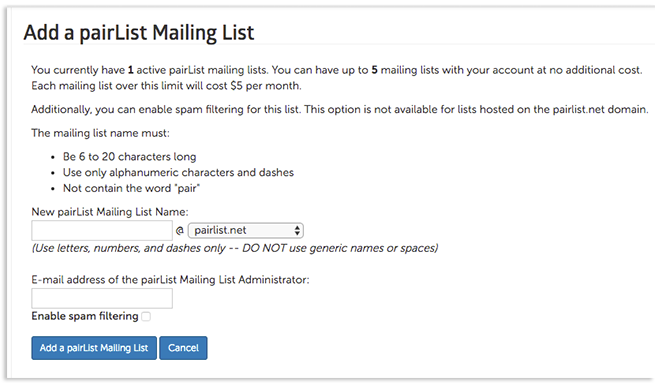 pair Networks offers a mailing service called pairList that runs on GNU Mailman software. Check out the table in our article, What is pairList? to see if your account type has pairList enabled and if you have any mailing lists included in your plan. Input the desired name of your mailing list and select the desired domain name. Input your administrative email address. You will receive important information about the mailing list at this address. Your mailing list will now be available for management in your pairList interface. For more information about using pairList, see our pairList FAQ.